Those looking for a 'pure' running book will find it in Jock: a memoir of the counterculture. 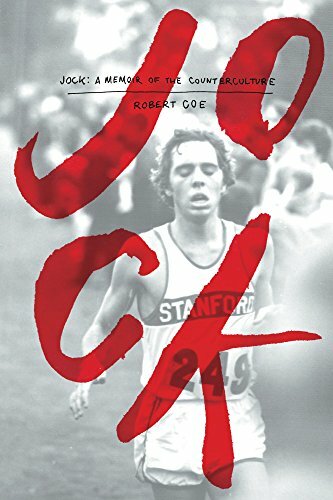 With Robert Coe's careful eye, you get a stunningly detailed look into the life of a competitive collegiate runner during one of the most tumultuous phases that the United States has endured. However, those looking for only a running book are in for a surprise as Coe takes us on a journey through the late-sixties and into the seventies. Most running books focus on the how-to of running, and a few comment on the history, but Jock seeks the totality of the experience. Set at Stanford from Coe's first days entering the campus to his final year, the narrative winds through the cross country season to the classroom, out onto the track, and eventually as far away as Stanford-in-Britain. Coe's journey is neither smooth nor straight, as befit the period in which he compete. His recollections of the protests on campus and the reactions both the rank and file students and the student-athletes. He's honest to a fault, showing that there was no unified front – some athletes were supportive of the administration of both the university and the country, even as he and many others were not. Coe does not pull punches. If he felt a particular individual deserved approbation, he delivered it, often in spades, as his descriptions of head coach Payton Jordan make abundantly clear. Yet that is balanced by the clear pleasure he derived from his teammates. A storied cast that included luminaries such as Don Kardong and the immortal Ron Clarke populate the book, lending it an indefinable air of groundedness. Running at the leading edge of the boom to come, he recounts competing against Pre and the other Ducks, the icy crap that he ran in at WSU for the Pac-8 championship, and the records that seemingly fall with every page. Coe's tales of the training runs, the effort that went into training, are worthy of a book of their own. Yet, side-by-side to that, are the stories of drug experimentation, the nascent hook-up scene, and a culture that was in a state of upheaval in which every rule could be, and often was, called into question. Coe gives an honest accounting of that, too, both of his own activities – yes, he experimented - and that of the late sixties. He joined some of the protest marches, investigated the claims and counter-claims, and grew into an adult seasoned by the experience at Stanford and in Europe during a pivotal sophomore year. Where all the other legends get pared down to the feats on the athletic course and sanitized to make them orthodox, Jock looks at the life of the athlete from an intimate perspective. Unlike the tightly controlled legend of Prefontaine, Coe ranges far and wide in an authentic effort to provide sense to running as it related to the age. In this lies the meat of Coe memoir, a blatant openness that peels back the veneers to expose the vicissitudes of the protest generation. For a person interested in more than a running book, Jock: a memoir of the counterculture delves into the running even as it touches, in first-person detail, history. PS. On Tuesday, I'll be posting an extended email interview with Robert Coe! Paul is the author of two fictional tales of runners: Finishing Kick (recognized by Running Times in their Summer Reading list July, 2014); and his newest novel, Trail of Second Chances. He blogs on the running life and interviews people that he finds interesting.